The use of temperature by Delacroix leads to the dynamic understanding of the simultaneous contrast of colors. I have re-immersed myself in the Journal of Eugene Delacroix. This work has always been a part of my aesthetic inquiry since I first delved into it as a student. Unfortunately, many of his color notes on his paintings are missing from the English translation of the Journal and the complete Journal is in French only after all this time. But there are still some color notes in the Phaidon edition that are worth exploring. Delacroix often spoke to the colorist, Michel-Eugene Chevreul and through these conversations about color, Delacroix came to understand the idea of “simultaneous contrast of colors“. He notes in his journal how he observed this phenomena in nature and how he began to apply it in his painting. 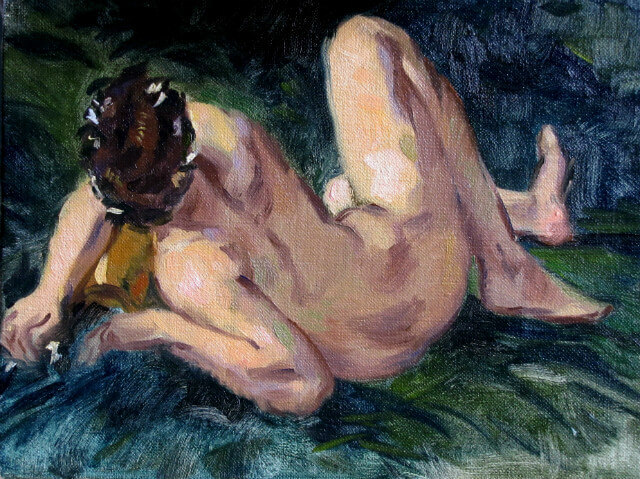 In the figure of the “Nymph”, Delacroix applies this idea of contrast in a very subtle and modern way. 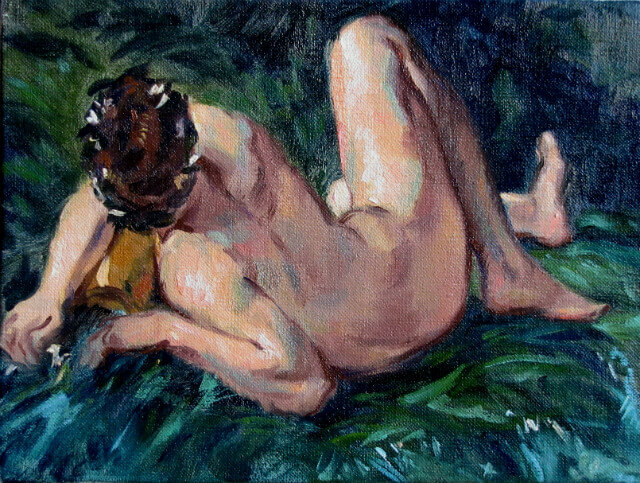 Delacroix develops a palette that is much like Robert Henri’s. Both developed the subtle contrast between tertiaries such as OY to BV or a contrast of near complements such as OY to V. But what is different about the two artist is that Henri strove for an underlying unity and simplicity of color through a palette based on sets of triads whereas, Delacroix strove for diversity of hue held in balance by complements or near complements. So this combined with a hierarchy of intensity allows Delacroix a full range of color temperature on which to model the figure. As Delacroix paints more and more murals, which require a composition to have less contrast and lighter values but a more compelling sense of color, this becomes his primary mode of working. Vermilion + White; Cadmuim Yellow + white; to these mixes is added Viridian+ Naples yellow +white; so one achieves an orange flesh color that is slightly neutralized by a yellow green. I found these combinations produced very surprising results that were colorful yet unified. I also found that the violets did not compete against one another and that the subtle variations between the blues added variety within the shadow area that might have otherwise appeared to unified. I also found that the constant juxtaposition of the warms and cools added a sinctillating effect. I also found that the yellow highlight worked exceptionally well in areas where the violet predominated. Delacroix took this technique from Rubens who used it constantly, although he could not identify why since one is apt to make the highlight violet. Experimenting with color combinations is a practice that I use to enhance my feeling for color as well as my sense of color memory. With such a practice, whether it has a practical side or not, allows one to develop a heightened sensitivity to color increasing one’s awareness to color in the natural world. But more importantly, I am drawn to color and am fascinated by the effects of juxtaposed combinations. Delacroix states that color is the most important factor in painting because it affects the viewer immediately and unconsciously before the subject itself is understood. It is the musical quality of paint.